Now, a few more details on this gown. It’s made from a saree. At the beginning of the XIX century, and already at the end of the XVIII, indian fabric was considered fashionable, and was imported. If not imported, indian designs were printed and emsbroidered on european fabrics. Muslins and gauzes were not the only fabrics available at the time, and white was not the only fashionable color. We can find many dark and bright colored regency gowns produced in England and of the same style all around Europe. The use of a saree allows to reach a less usual and rich look, keeping the gown historically accurate. The risk, with regency gowns, is to end up with a nightgown. 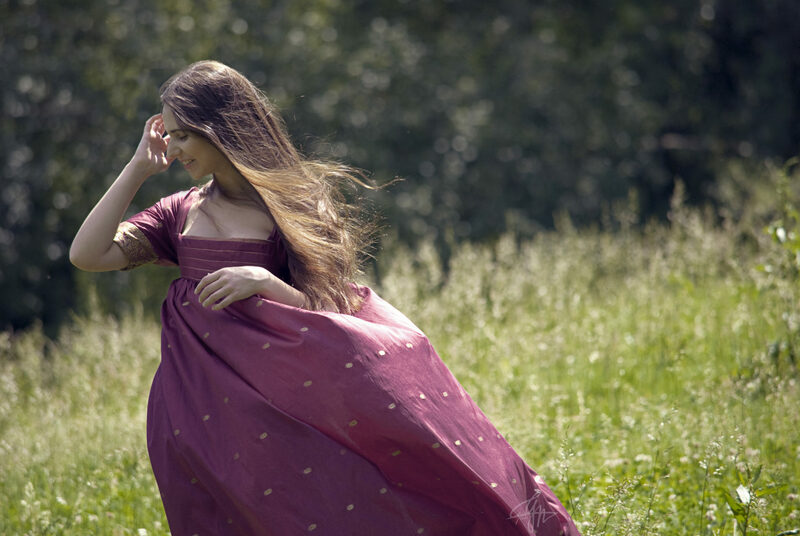 I don’t like regency gowns, because of that. So you can trust that mine won’t give you that effect. These styles can be mistakens for easy to make with modern sewing techniques, but this will always lead to a modern looking gown. My recipe for a look that will make you stand out of this world of nightgowns is “construction and undergarments”.This gown does not need a pair of stays or a corset. Many gowns of this time did not. But it has the shape and the right support to avoid the “bra look”. The bodice is strong enough to lift your bust to perfection. Ordering this dress you will receive a petticoat (properly made, according to originals) and bustle pad. 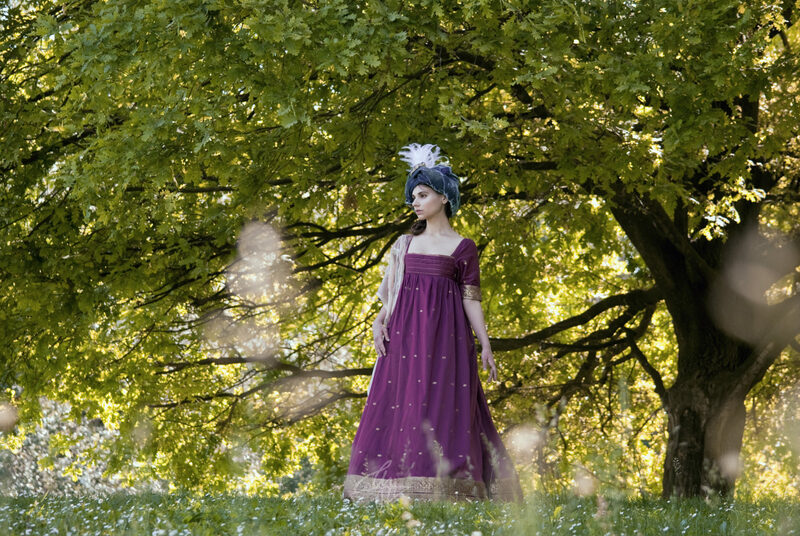 That little hump at the back and the richness of fabric there will make this enseble look righ, luxurious, just what you need, if you’re tired as me of regency nightgowns an want something different. To make this gown I will use silk or cotton vintage sarees. Please note that not every kind of saree is always available in the color you with your dress to be. White is hard to find, for example. This gown is made as a basic version, and covers a basic range of sarees. But it can be upgraded to court gown adding some budget to the saree cost, there’s no limit to what you can add to this dress to make it more somptuous.